Living green can strengthen the basic principles of the hospitality industry, let me show you how! People seek and pay for shelter, food, beverages and comfort during their travels all around the world since we can remember. We can call this phenomenon and the market it creates, ‘the hospitality industry’. Over the course of time, the industry has developed in many different ways, from braaiing in a primitive camp in the bush of South-Africa, to sipping Pornstar Martini’s in a sky lounge in Abu Dhabi. However, the basic doctrines of the hospitality industry have stayed the same: shelter, food/beverages and comfort. But, how can participators in the hospitality game strengthen these three standards with the subject being “living green”? Being able to offer shelter is about offering a place where guests can stay warm and dry when the elements outside are undesirable. The word “shelter” actually dates back to the 1580s… “structure affording protection,” it was likely an alteration of Middle English sheltron, “roof or wall formed by locked shields”. So indeed, the most elemental part of shelter is a solid roof. The roof being so important, why not make it something to build value and reduce costs, while at the same time being a rainwater buffer, noise canceller and biodiversity increaser? Implementing a green roof will provide all of these benefits and it comes in a different shape for every occasion. Creating an intensive green roof will give you the opportunity to make a wild jungle or a proper farm, but is more costly. While an extensive green roof provides a subtle sedum matte, being a lower investment. Both of the roof versions come with all the benefits mentioned above, but the main difference is that the intensive roof offers what the the extensive doesn’t: the creation of traffic towards your business. Making your green roof a real hotspot point will attract people to come over, have lunch, diner or even book a room. During the visit to this special amenity, the chances are high that these guests will share their adventure online and reach people you haven’t reached before. Here you see the brand new roof of La Place in Nijmegen, The Netherlands. 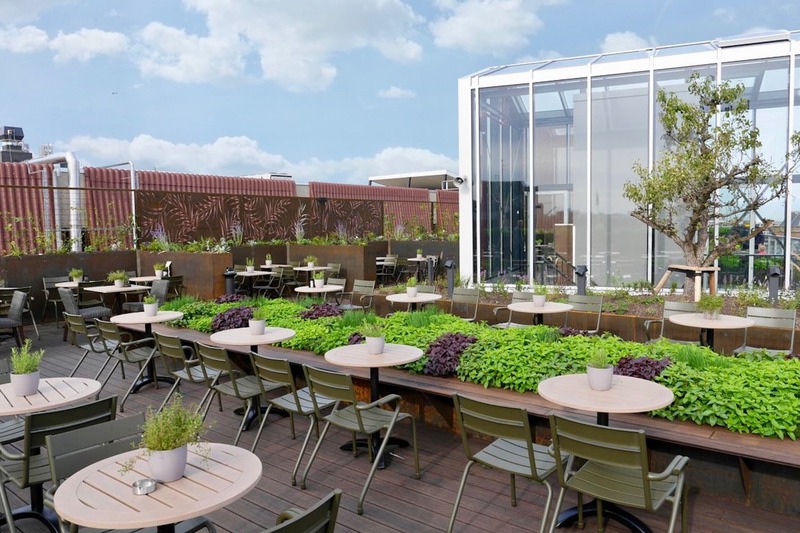 This terrace is a prime combination of extensive and intensive green roof design for a hospitality setting. Having a healthy lifestyle is an evermore meaningful subject for a lot of people nowadays, and one important part of it is eating nutritious and green. This lifestyle change raises the demand for healthy food in the hospitality industry, and living green can help to meet this demand. Cooking with more herbs and vegetables is a big step that can be taken to increase the healthiness of the food served. These greens can be bought from all over the world but what better way to complete the story than to source locally or, even better, source it yourself? One solution is creating a green roof, as previously mentioned, and grow all the crops you need there. However this will not be a solution that will fit every company. An easier way to implement living and eatable greens is, or example, using your outside space to create a patch with greens you can cut and use immediately. To show and grow greens inside is a bit more difficult but with the service and solutions from the company Hrbs, it doesn’t have to be. CIRCL reveals an easy and charming solution to implement some living green is to place and edible greens… just right in front of the guests! Lastly, but definitely not the least important, comfort. Let me get one thing out of the way: no, living green won’t get you a more comfortable bath or softer bed, but it will provide comfort in other far-reaching ways. By implementing living green throughout your location, guests have a more relaxed experience and feel more at ease. 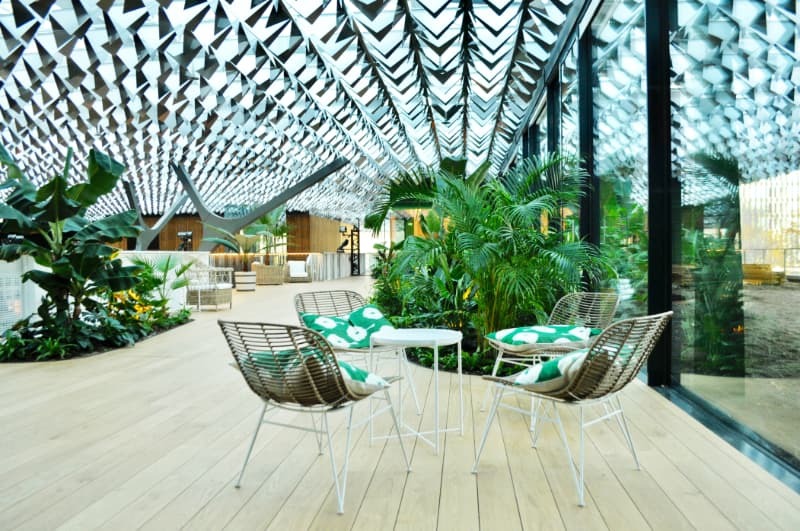 Especially for hospitality locations in large and busy cities, offering a place where your guests can escape the hectic outside world is important. Imagine a B2B guest traveling on a business trip who arrives to the hotel, tired of the countless meetings from the day. What better way to welcome this guest than in the relaxing and biophilic atmosphere that a green oasis offer? Able to think clearly, the guest can make a good reflection of the day and plan ahead which steps need to be taken to achieve the set goals. This way, the guest will have a better experience, give a higher rating and will definitely return the next time. This green oasis at the National Postcode Loterij in Amsterdam is a great example of how a hospitality businesses could create an escape from any crowded city. 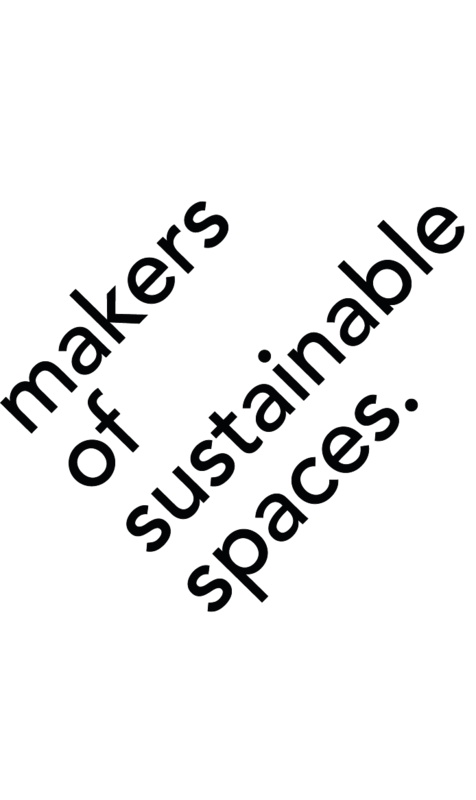 All together, there is a lot that hospitality businesses can do to implement living green and profit with it at the same time. By redefining these three basic principles hospitality, the value of a business will go up while being future proof at the same time. Depending on the the budget and setting, there will always be a fitting solution.